Rides are always better when they come with commemorative spoke cards. With the Enhanced Transit Corridors (ETC) plan freshly adopted by City Council, the second (of three) Central City in Motion online open houses in the books, and TriMet seeking input on their Division Transit Project — now is a good time to talk about what makes good bus station design. 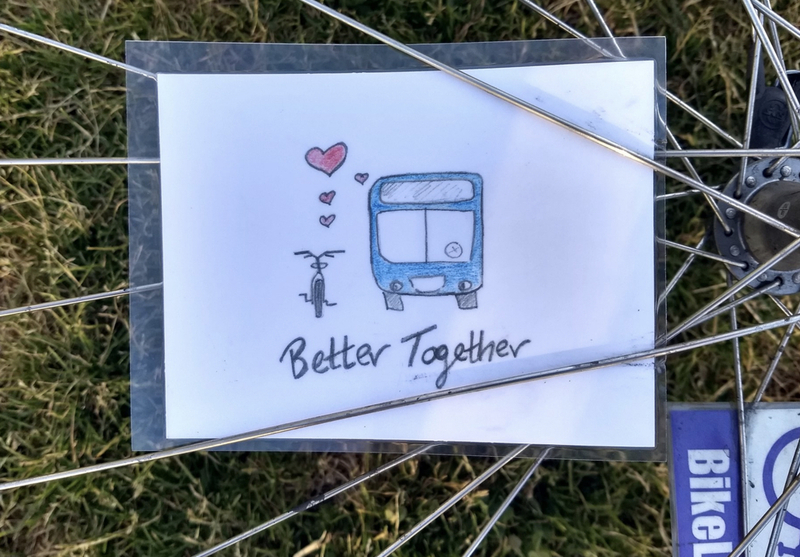 Earlier this month as part of Pedalpalooza, the Portland Bus Lane Project and BikeLoudPDX hosted a very wonky bus and bike lane ride with help from Portland Bureau of Transportation Planner Nick Falbo. This PBOT graphic shows where they want to make transit better. UPDATE: The plan was adopted 3-0. At 2:00 pm today (6/20) Portland City Council is set to hear public testimony on the Enhanced Transit Corridors plan. The move will allow the Portland Bureau of Transportation to move forward with design and development of projects aimed at making transit faster, more reliable, and ultimately more competitive than driving. Someone snuck their “pet issue” into an official questionnaire. 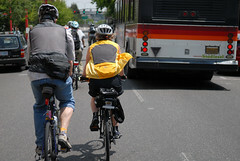 One of the many roles BikePortland plays in the regional transportation sphere is to keep people honest. A recent episode involving a candidate questionnaire gone wrong is a good illustration of that. 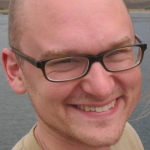 Last week a candidate running in an election in Washington County alerted us to a questionnaire from the Northwest Oregon Labor Council (NOLC). “Check out question #12,” he wrote to me in an email. The City of Portland and Metro have advanced a concept they believe will motivate the general public to get out of their cars and seek alternative modes of transportation. Using speed bumps, bioswales, road diets, lane elimination, car lanes turned into bike only lanes, curb extensions and speed reductions to encourage more people to use Mass Transit. The unintended consequence is that it makes it impossible for Bus Operators, who share the same roads, to meet their schedules resulting in a record number of attacks on drivers. The number of assaults has nearly doubled each of the last four years. Please share your thoughts on this strategy and do you think it makes sense to continue? This could be a lot more common in the future. Portland is changing and so are our streets. Whether those changes help or harm our city is entirely up to us. One of the biggest changes is an increase in the amount of people who drive. Congestion is everywhere and one of the victims are bus users. During peak hours especially, they get stopped behind single-occupancy vehicles. It’s maddening when public transit is delayed by such an inefficient and costly mode of transportation. One way the Portland Bureau of Transportation has decided to deal with this problem is to focus on getting cars out of the way of buses. 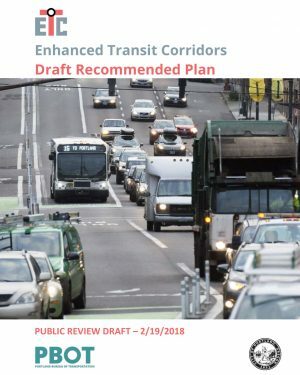 For the past year or so they’ve worked on the Enhanced Transit Corridors plan, which is now in draft form and open for public comment (until March 26th, sorry for late notice). 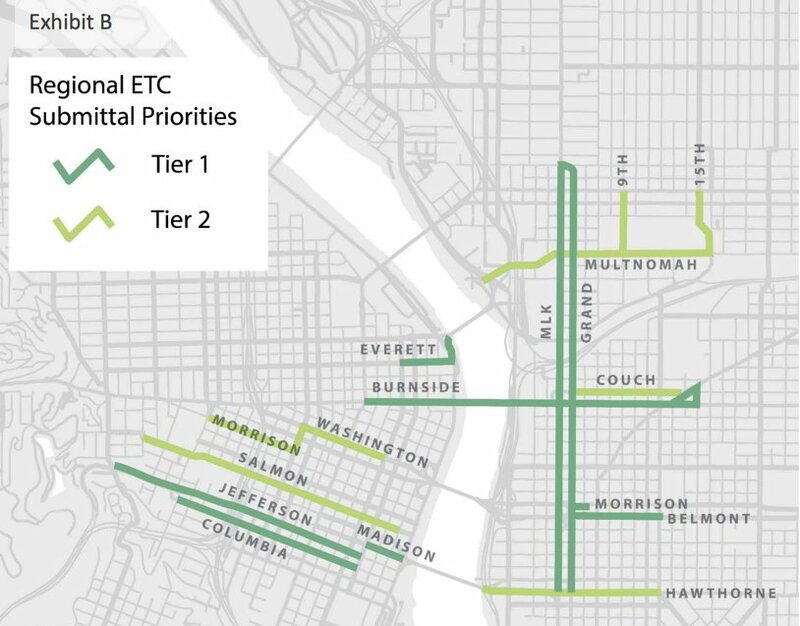 The plan aims to institutionalize the concept of “enhanced transit” within the City of Portland, and to identify projects that will improve transit capacity, reliability and travel time. bus, but the variety of contractors is an obstacle. As Amtrak invests in improving its trains to carry bikes, some customers are warning that Amtrak’s buses are falling behind. The Amtrak Cascades line, between Eugene and Vancouver BC, is both one of the most-ridden regional rail lines in the country and maybe the bike-friendliest. For $5 on top of your fare, you can easily check an unboxed bike to most stops on the line and reclaim it like any other bit of luggage. 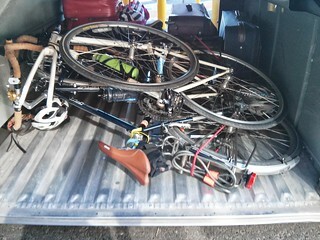 The service has been so popular that the hooks in Amtrak’s baggage cars started filling up. So two years ago, the Cascades added more hooks, boosting its bike capacity by 67 percent. 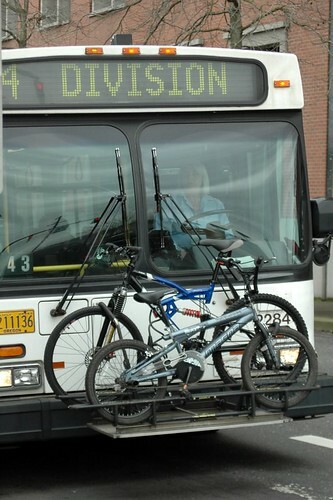 TriMet says its drivers are temporarily emphasizing a longstanding rule that bikes loaded on its bus racks ares supposed to be stripped of bulky accessories before boarding. We heard about this after two readers sent accounts of bus drivers telling people to remove such add-ons before boarding. 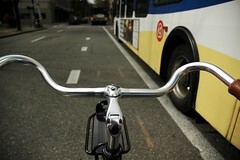 TriMet Bicycle Coordinator Jeff Owen confirms that it’s “a reinforcement of our messaging for a while.” The issue may take new importance due to TriMet’s newest bus model, which improves driver lines of sight by extending its windshield almost as far down as the rack. 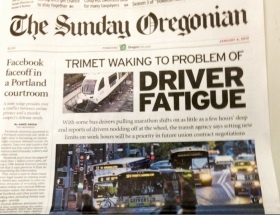 On Sunday, The Oregonian published a major front page story on the issue of driver fatigue at TriMet. The report was the result of an eight month investigation into driving records and the findings are quite disconcerting to say the least. As someone who regularly shares the road just inches from buses and MAX trains, the thought that a driver might be drowsy or asleep at the wheel is very scary. The Oregonian story recounts several anecdotes and backs them up with TriMet’s own reports and other documentation. In one example, reporter Joseph Rose wrote that, “In a 2010 case a veteran Line 75 driver decided to retire rather than fight a report that he fell asleep at the wheel ‘almost every day. '” When a rider complained that one driver had completely fallen asleep at a stop, the driver was never disciplined. 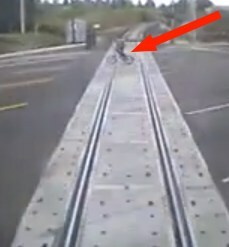 Still from TriMet WES video. TriMet is trying to get the word out about safety when it comes to WES Commuter Rail trains and conflicts between buses and bikes. As part of a summer safety campaign that kicked off Monday, the agency has released five videos showing close calls between people crossing tracks in front of WES trains. They have also sent out a new, in-depth training bulletin to all bus drivers that is focused specifically on bicycling. 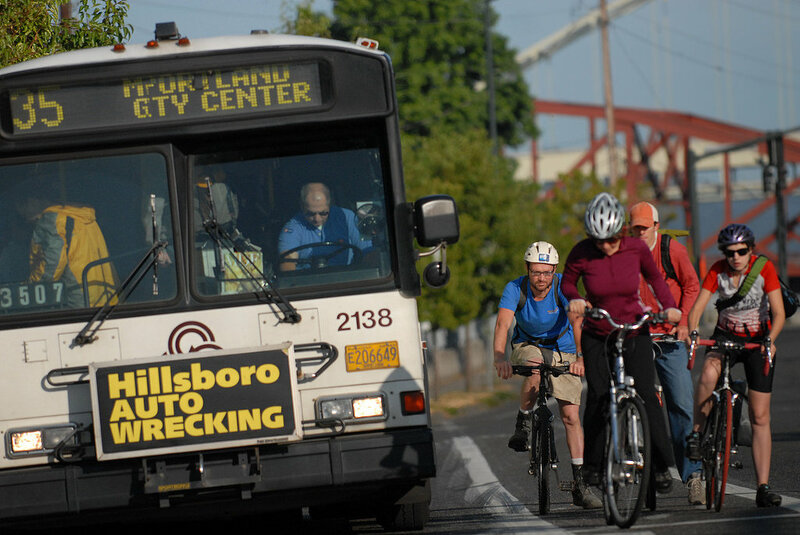 TriMet has just announced that they’ll discontinue the audible warning system they’ve been testing in an effort to improve safety of people biking and walking near buses.